Science fiction and fantasy have plenty of well-rounded, multi-faceted characters, who reveal a new side of themselves every time we see them. But somehow, our favorite characters are often the ones who basically have a single joke that they repeat over and over. Here are a dozen one-joke characters who never get old. To assemble this mighty list, we asked our Facebook followers over the weekend. Thanks to everyone who responded, and here were your top selections! 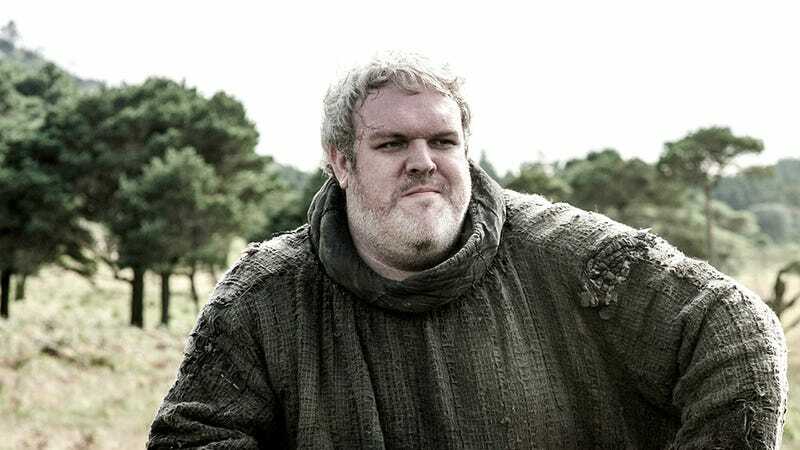 Hodor's name is the only thing he ever says. Brilliant. The show seems pretty careful to avoid having him speak too often, in line with the books — but whenever he does, it's usually a perfect bit of comic timing. Hodor! Actually, in his first appearance, Strax's main joke is that he's a Sontaran who's become a nurse. But every time since then, he's been the dimwitted Sontaran butler in Victorian England who responds to every situation by wanting to blow things up and unleash laser-monkeys. Why not Zoidberg? Why not, indeed. Actually, in the show's first season, the running joke with Zoidberg was his lack of medical knowledge — but since then, it's become the fact that nobody loves him. Poor guy. No matter what he does, his cabbages always get destroyed, usually by Aang. And he usually says the same thing: "My cabbages!" That's what you get for trying to sell cabbages while there's bending going on. Image via Josh Rivers. He's the fish who shouts "My leg!" in a number of episodes of Spongebob, as something nasty happens to his un-fish-like appendage. So, sort of like Cabbage Guy, in fact. Why do bad things happen to minor animated characters? He just sort of sits there and props up the bar at Quark's Place, but you always hear about his amazing wit and exploits, and in one episode we finally get to know him a bit better — when everybody thinks he's dead. Even apart from the "never speaking" thing, his surly body language and facial expressions sell the joke. Like a number of these characters, Magnitude has a catch-phrase, and it's pretty much all he ever says. "Pop-Pop!" Over the course of the show, we've learned how his catchphrase came to be, and also seen him nearly lose it to a wealthy new student — but Magnitude is still Magnitude. Simon Pegg is so massive in the Trek films, he gets his own sidekick: the alien Keenser, who hangs out with him on the ice planet and later becomes his assistant aboard the Enterprise. Keenser mostly gives Scotty a reproving look whenever Scotty's gone off the deep end, but he's played by science fiction MVP Deep Roy, who puts a lot of comedy into the mostly silent alien. This one is sort of debatable — like a few other characters on this list, Vizzini has a few great gags including his botched plans and his attempts to poison Dread Pirate Roberts. But he's mostly remembered for his habit of saying, "Inconceivable." Which doesn't mean what he thinks it means. He's the walking tree character, and he's soon to be a major movie star. Pretty much all he ever says is "I am Groot," and it never stops being awesome. There are ten members of the Zathras clan, and they're all named Zathras, although the pronunciation changes slightly. "You didn't meet Zathras. You met ZATHRAS." Ah, that explains everything. Actually, Baldrick has a couple of things going on — but his main joke is usually that he's the dimwitted sidekick to the slightly more crafty Blackadder, who always says, "I have a cunning plan," right before he comes up with something terrible. Who did we miss? Or who do you disagree with on this list? Let us know!